WANT MORE? 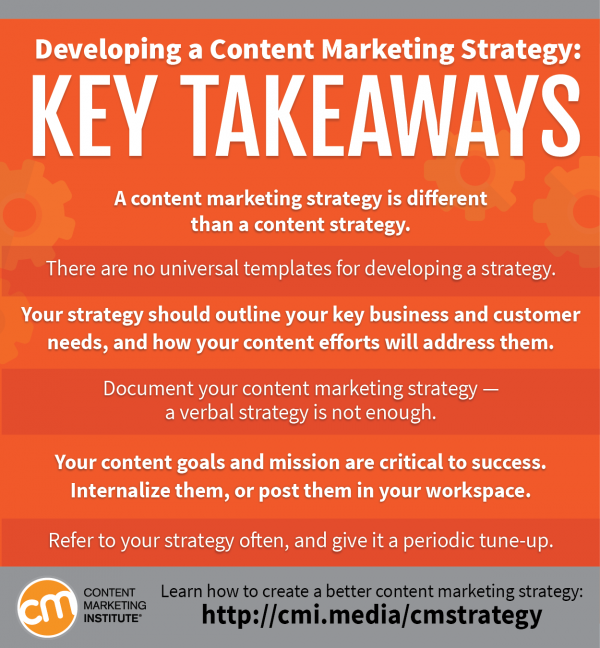 More information on how to create your content marketing strategy is discussed is more detail below or you can download The Essentials of a Documented Content Marketing Strategy: 36 Questions to Answer. WANT MORE? Here are 10 content strategy practices that will make you a better marketer. WANT MORE? If you are interested in planning, check out these 23 templates, checklists and guides. Learn more: Get our essential starter kit: Mastering the Buy-in Conversation for Content Marketing. Learn more: Get help determining where content marketing fits in your marketing plan. Learn more: Get an in-depth look at how to create and use B2B buyer personas. You can also follow this five-step guide on mapping your content. Learn more: Uncover the heart of your brand story with these six questions. Learn more: For additional insights and advice, take a look at how to build social media into your content marketing processes. Don’t have time to build a complete content marketing strategy? Take a look at how you can simplify the process with a one-page plan. Do I need to share our content marketing strategy with other teams/departments in my company? We’ve found that it’s beneficial to give everyone in your organization access to your content marketing strategy — even those who may not be directly involved in the content marketing process. In short, consider this: How can you use the principles of content marketing to “sell” content marketing throughout your organization? What do people care about most? This should help you determine which components of your content marketing strategy are most appropriate to share with each team. How often should I update my content marketing strategy? However, other aspects of your content marketing strategy will likely benefit from being reviewed and updated periodically. To ensure that your content marketing program remains on target, consider revisiting your channel strategy, core topics, and team processes on an annual basis — or more often if you are just getting started. Keep up with the latest innovations for developing a content marketing strategy and executing on your plans. Subscribe to Content Marketing Institute and get firsthand access to the latest tools, techniques, and insights.